Another year, another compensation report on the top salaries of people working in nonprofits. GuideStar does an enormous service, of course, in compiling all the statistics for this every year. The data will show where your salaries stand relative to similar organizations of similar size in similar geographies, and such data should definitely be available to nonprofits. It is a starting point. But something is missing—no fault of the report’s authors, but reflective of nonprofits as a sector and the issues we choose to address. As in compensation studies of years past, the authors have in their executive summary documented the gender gap in nonprofit CEO positions. Not only do women get paid less than men for their work on like organizations, but their presence in leadership gets more and more sparse the higher the annual budget of the organization (and the top salary) gets. The report shows that the gender salary gap ranged from 11 percent for CEOs at organizations with budgets of $250 thousand to close to 23 percent at organizations with budgets between $25 million and $50 million. Geography was, as usual, critical to salary levels. For the ninth consecutive year, CEOs in Washington, D.C., brought in the highest salaries among 20 metropolitan statistical areas. Portland, Oregon CEOs were paid the least, although when cost of living is figured in, Oakland CEOs had the lowest purchasing power. What this report does not and cannot cover due to the nature of current data collected in 990s is the question of leader-to-lowest-paid-worker ratios. Salary equity in nonprofits is something that even the most damning of newspaper exposés of nonprofit CEO compensation rarely address. 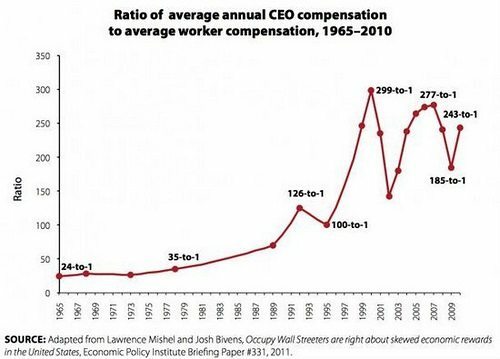 Clearly, the wealth divide is one of the most high tension issues of the decade; that makes it potentially moveable, but the nonprofit sector, though it may participate in discussions of salary ratios for the for-profit sector, has not generally taken the issue up as its own. Should this sector more thoughtfully declare itself as supportive of a reasonable ratio between highest- and lowest-paid workers? And shouldn’t it establish a measurable standard of practice that will make the sector beacons for the issue? Or will we just wait around to be dragged kicking and screaming into an issue that we should, by rights, lead on—by example, as well as by word? There are pushes abroad to have charities be transparent about ratios. In public policy, the exploration of salary ratios as a benchmark is also catching on. The Dodd-Frank financial reform law includes a requirement for public companies to disclose their CEO-to-worker pay ratios, but today, nearly three years after the law passed, the Securities and Exchange commission still hasn’t put the rule in place. The ratio question is creeping up on the world and nonprofits have taken no leadership in it. Sometimes they’ve even engaged in secrecy rather than transparency about their own pay scales. They are on record in some locations as asking for special dispensation in the paying of minimum wage. Let’s see some leadership here, Independent Sector and National Council of Nonprofits! It will accrue, in the end, to building our public image as a sector. AN NPQ CLASSIC: This article reveals the critical environmental factors in some nonprofits that create fertile ground for shared leadership.